Our next Taster Session will be on Tuesday 3rd April 2012 from 6.45 - 7.45 at London Fields Fitness Studio, Hackney. 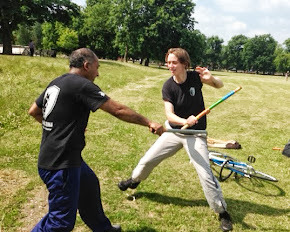 This is a great opportunity for you to train with other new students in Escrima Concepts in a relaxed and fun environment. If you are thinking about trying Escrima, now is the time. We are pleased to announce that we will have a new class starting on Thursday March 8th from 6.15pm - 7.15pm at London Fields Fitness Studio, London Fields, Hackney. The current Tuesday class will start at 6.45pm - 7.45pm. In conjunction with this, we will be introducing a new pricing structure and block booking fees, which we will inform you all about at the next training session.